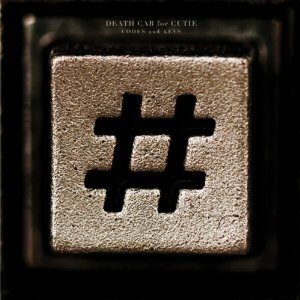 Purchasing a Death Cab for Cutie album is like purchasing a cup of coffee from Peet’s. Though it won’t be an epic or life altering experience, you know you’re about to enjoy a decent cup of coffee that will get you through the day. What’s more, you’re comfortable with drinking Peet’s coffee because you know thousands of other people enjoy it too. DCFC’s seventh studio album Codes and Keys shows that the Bellingham quartet understands the key to maintaining a long career in an industry where flash-in-the-pan bands easily outnumber hugely successful bands 5:1. The key to the riddle is consistency and the formula boils down to this: a sprig of solid songwriting + mastering the art of the catchy melody + a dash of Alan Moulder. The band meanders down the evolutionary road in a logical stepwise fashion with Codes and Keys expanding its sound by employing buzzing synthesizers and increased electronic instrumentation. If the opening track “Home is a Fire” sets the tone for the album, then the listener will know off the bat that this album is more Postal Service’s Give Up than Transatlanticism. However, “Unobstructed Views,” a dreamy grandiose love song with a three minute piano introduction and simple lyrics, will take you back to the vintage DCFC days. Out of all the songs on the eleven track album, “Underneath the Sycamore” feels the most pedestrian in terms of songwriting, instrumentation, and production and would have been better suited on Plans than Codes and Keys. I venture to say that the album conjures up a sense of contentment that is reflective of the band’s personal and creative journey from 1998 to the present. Though nothing to write home about, Codes and Keys is consistently solid throughout without being entirely predictable. It’s like a pretty good cup of Peet’s coffee. Check out our reaction to the video for “Home is a Fire” here.